1. Your theme: Buy curtains and blinds that will blend in with the whole theme of your house. Put in mind the color of your walls, the color of your furniture, and the general look of the living room. If you choose a vintage theme, you should look for designs and colors that go with it and bring out the true theme you were looking for. If you are going for a contemporary and modern style, you can look at catalogs that provide a range of new designs you can choose from. You can play around with colors: mix and match different colors that blend well, and ensure that the theme is duplicated through to your furniture, rags, flooring and carpets. 2 Light: Natural light from the sun during the day refreshes your entire house and saves you on lighting bills. 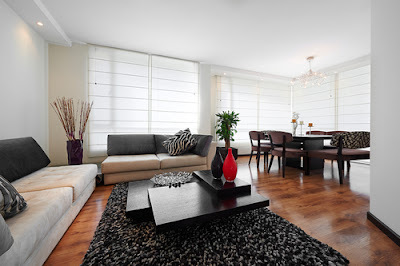 You should consider getting sheers that will allow in light into your living room. When choosing blinds for your living room, always consider the amount of sun that will be coming in, and buy one made of material and color that would not be damaged by the sun. If your living room gets a lot of direct sunlight and you choose to go with curtains, try to use colors that are not too bright, because their brightness will fade over time when they are exposed to the sun. 3. Your furniture: The furniture in your living room will determine the curtains and blinds you buy. First, you should consider getting what coordinates with your furniture, in terms of color and design. The other thing you should consider is the material that you furniture is made of. If you have delicate fabric, then you should get drapes that filter out light and other environmental factors that may affect your furniture. How you arrange your furniture will also determine what to buy. If you put chairs too close to the window, then you may want to consider something slightly long, because a short one will keep blowing to you, and distracting you. 4. Cleaning: When buying curtains and blinds for your living room, always consider how easy it would be to clean them. 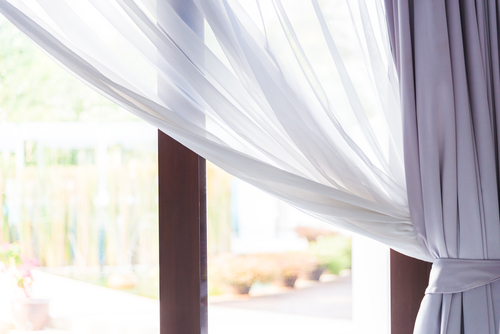 For curtains, go for fabric that does not stain easily, and one that is easy to wash and dry. When buying blinds, look for ones that have been lined horizontally so tat you can easily put your fingers between then and clean away the dust and pet hair that may have accumulated in them. 5. Your budget: The amount of money you plan to spend on the curtains and blinds with determine what you get. If you are on a budget, you can check out different shops and compare prices within your range to see what would be the best deal for you. One of the key things of buying curtains and blinds even when you are on a budget, is durability. Always go for durable materials so that you do not have to keep shopping for new stuff every time due to wear and tear. 6. Hardware: always consider the other accessories and hardware that the curtains and drapes come with. Look at their functionality. Do the curtains slide easily inside the curtain box to allow easy closing and opening? Are the blinds flexible enough so that you do not have to strain yourself opening them? remember that you will be spending a lot of time in your living room, and so they should function well to avoid frustration when it comes to opening and closing.